Sam's name was among the nominations announced yesterday by the Screen Actors Guild. His performance as trainer in the TV film RUFFIAN has earned him a nomination for Outstanding Performance by a Male Actor in a Television Movie or Miniseries. It comes as no surprise to those of us who have seen the film! Sam does have some heavy-duty competition against John Turturro, Kevin Kline, Michael Keaton and Oliver Platt. The awards ceremony will be held on Sunday, January 27th, at the Los Angeles Shrine Exposition Center and will be broadcast nationally on TNT and TBS. The romantic comedy starring Uma Thurman with Sam in the role of her father will be opening in US theatres on March 7, 2008. The story centers on Emma (Thurman), a successful but uptight relationship expert with a hit radio show and an upcoming book. She is serious and sensible about the issue of love and gives frank, 'on the nose' advice to women on how to find the right man without wasting time on the wrong ones. Emma believes she has met her own perfect match in Richard (Colin Firth) a successful and conservative publishing executive. However, just weeks before her wedding Emma discovers she is somehow already married to Patrick (Morgan) an irresponsible but charming neighborhood fireman with a big secret. If you were one of the unlucky ones that missed THE ASSASSINATION OF JESSE JAMES BY THE COWARD ROBERT FORD in theatres, you’ll be glad to learn that Warner Home Video has announced it will be released on DVD on February 5, 2008. The film received only one Globe nominations going to Casey Affleck for Best Performance by an Actor in a Supporting Role. The New York Theatrical release of the documentary film "Bound to Lose" will take place at NY's Anthology Film Archives from December 7 to 13. Each night will have different live performances, rare short films and special guests. 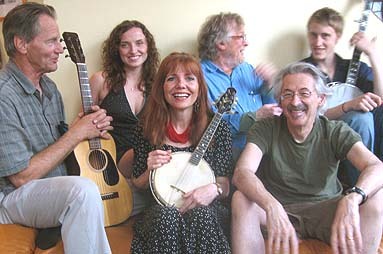 On Sunday, December 9th, Sam and his son Walker will perform with the Holy Modal Rounders, now incarnated as the Velocity Ramblers. Performances will take place at 4 pm and 10 pm. When fiddler Peter Stampfel collided with guitarist Steve Weber during the ‘Great Folk Scare’ of the early-sixties in New York, the two musicians formed a powerful bond based on their shared fascination with American roots music and early psychedelia. Dubbing themselves THE HOLY MODAL ROUNDERS, these eccentric outsiders have been playing their unique brand of psychedelic folk for over four decades, barely surviving on the fringes of the music industry while drawing a dedicated following of luminaries and lunatics. 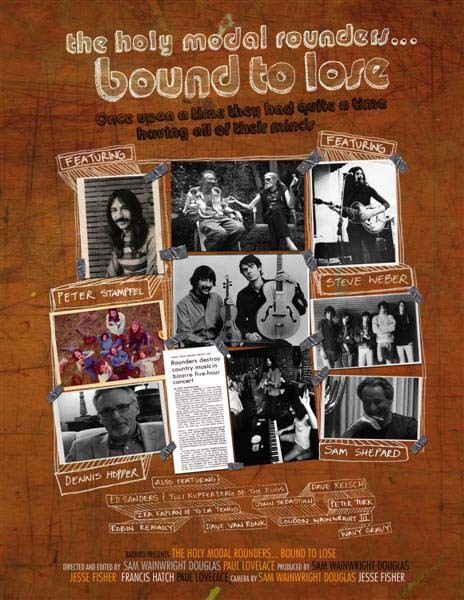 The 52-minute documentary features endearing and hilarious appearances by Sam (former drummer for the Rounders), Dennis Hopper, John Sebastian of The Lovin’ Spoonful, Peter Tork of the Monkees, Ed Sanders and Tuli Kupferberg of the Fugs, Loudon Wainwright III, Ira Kaplan of Yo La Tengo, music editor Robert Christgau of the Village Voice, Wavy Gravy and many more. On December 8th a film narrated by Sam called "Play on John: A Life in Music" will be presented. John Cohen's fingerprints and influence have been felt, seen and heard throughout the world of traditional American Folk Music. This 52-minute documentary tells the story of this remarkable individual and true American treasure. He is a modern renaissance man - musician, painter, documentary filmmaker, print maker and photographer. The documentary features rare footage of Bob Dylan, an interview with legendary folk singer Pete Seeger and showcases Cohen's involvement with the people and personalities of The Beat Generation. It will make its worldwide television premire in 2008 on the Smithsonian Channel. 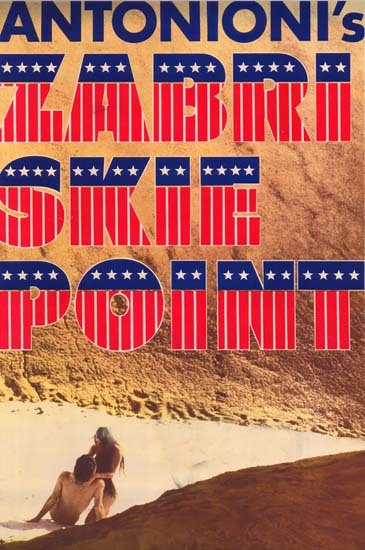 ZABRISKIE POINT will also be one of the films screened this week at the Archives. Sam co-wrote the screenplay while the band was recording its psychedelic landmark album "The Holy Model Rounders Eat the Moral Eels". “Removed from the late-sixties climate of dissent, Antonioni’s only American-made film now stands as a startling work of art, alternately stark and excessive, cathartic and self-indulgent. Long Islanders get a rare chance to see three works by one of the greatest contemporary American playwrights. 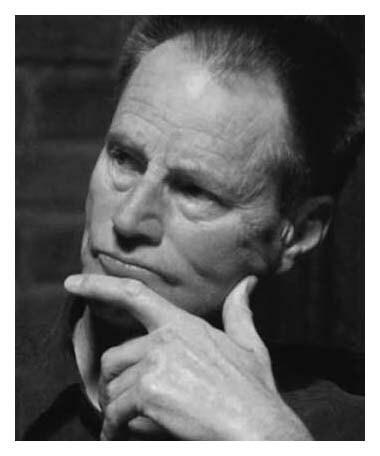 The Dix Hills Performing Arts Center at Five Towns College presents its Sam Shepard Festival the next three weekends, with student performances of "Lie of the Mind," "Fool for Love" and "Suicide in B Flat." Instrumental in putting the festival together is Kathy Curtiss, director of Five Towns' acting program and a self-described "Shepard connoisseur." Last year, she directed a Shepard festival for Manhattan's Michael Chekhov Theatre Company and previously directed Hollywood actor Stuart Whitman in "Lie of the Mind" in California. "I think he's one of the great American writers," Curtiss said of Shepard, "with a rich contemporary language that has a lot of important things to say about families and our way of life in this country." In a recent interview producer Orian Williams announced that he had completed a documentary in which Sam will appear. It covers twenty days in the life of Jack Kerouac when he went up to Big Sur and wrote 'Big Sur' right after 'On the Road' had come out to great success. He was sort of depleted of all his energy and had returned to drinking and drugs. His buddy Lawrence Ferlinghetti suggested he come up and stay in this cabin and kind of detox. And he did, but he went darker and drank a bit more and went into a pretty crazy place. The film is presently in the final stages of production. Sam has been in Santa Fe this month filming FELON, which also stars Vil Kilmer, Stephen Dorff, Anne Archer, Harold Perrineau and Marisol Nicholas. His role hasn't been defined but his character's name is Gordon Camrose. 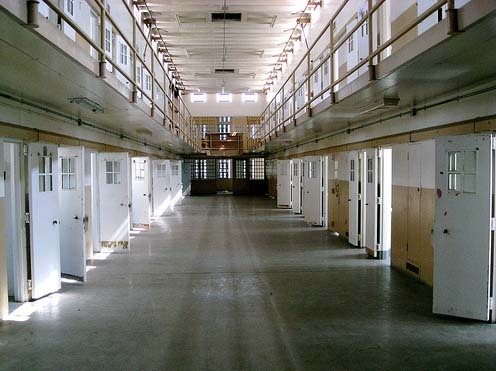 The 22-day shoot is being done at the Old Main section of the State Penitentiary, site of the 1980 riots, the newer state prison, and in and around Santa Fe. The drama is about a family man who is convicted of murdereding an intruder. He is then sent to a maximum-security prison where he struggles to survive the violent penal system in which a corrupt lieutenant tries to maintain power and order even if it means crossing the line. Ric Roman Waugh, who worked as a stuntman with Kilmer on "True Romance" is directing. This will be the second time Kilmer has worked with Sam in Santa Fe with BLIND HORIZON (2003), but it's the third time for their partnership with their more memorable film, THUNDERHEART (1992). The producers hope for a big screen release next year. While filming, Sam was spotted at Maria's Mexican Kitchen, which he became familiar with back in the 80s when he lived in Santa Fe. The couple was often out and about in town, including those Saturday breakfasts at Café Pasqual's and polo out at the polo grounds. 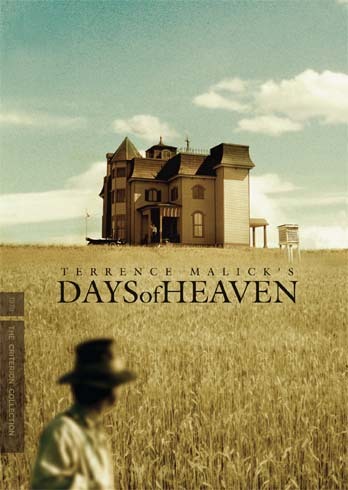 Texas filmmaker Terrence Malick has entered the DVD pantheon with his work reissued by the Criterion Collection. In remastering DAYS OF HEAVEN, Malick evidently took an unsentimental approach to his masterpiece: According to Criterion's technical director Lee Kline, he forbade the words "golden" and "warm" - two adjectives invariably used when the film comes up in discussions of the remastering. So while the earlier DVD edition exaggerated burnished sunset glow, this one more often spills a purplish chill in the air; it's a look that both rescues the movie's beauty from its own legend and reminds us, even during the story's most carefree moments, that paradise never lasts. There is a simple eloquence to its story of a man (Richard Gere), his lover (Brooke Adams) and his young sister (Linda Manz), who leave Chicago to work in the wheat fields owned by a rich and dying farmer, played by Sam, whose movie star sideline to his playwriting took off after this. The setting is as gorgeous as the romance is cynical and the young sister's narration gives the film its elegiac tone. What's interesting is that the voice-over wasn't even planned until after the film was shot. 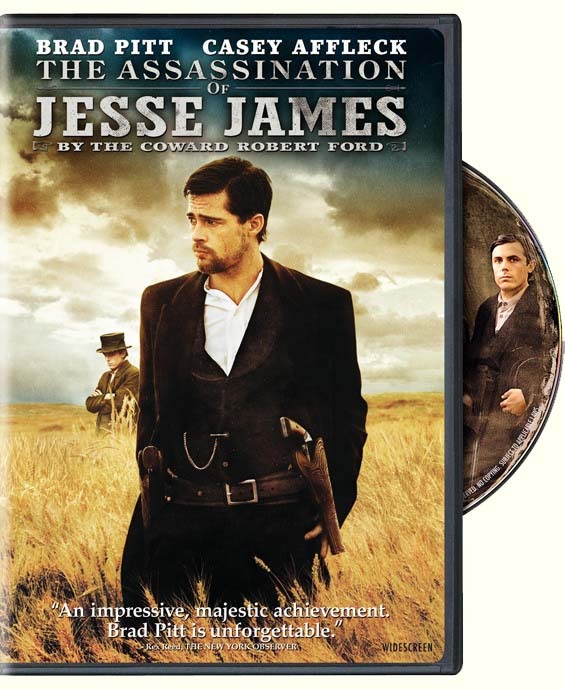 THE ASSASSINATION OF JESSE JAMES BY THE COWARD ROBERT FORD premiered with a limited release in the US on September 21. The delay in releasing the film was partly due to the complexity of how to market the film since it's definitely not your standard western. Producers can hardly complain with a respectable 75% on the infamous Rotten Tomatometer. Brett Buckalew of Filmstew described Sam's performance as "Still possessing the right stuff - Sam Shepard is flinty perfection in a small role." 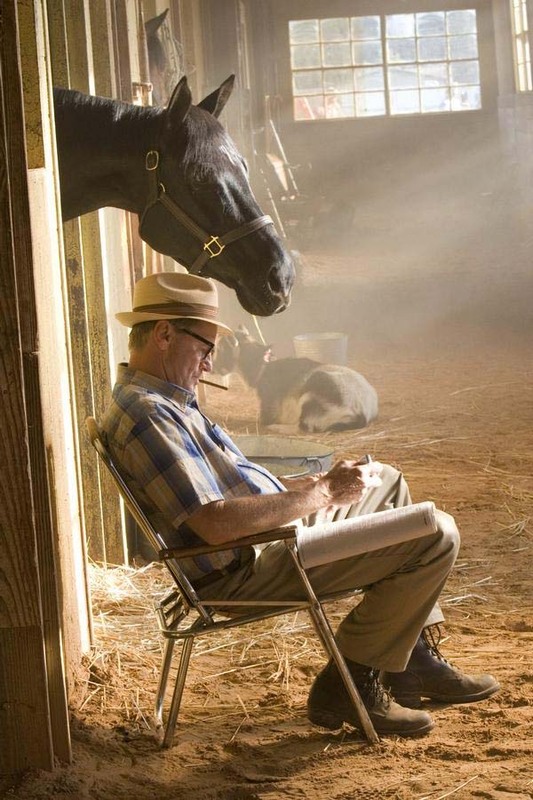 Yes, Sam's presence on the screen was far too little for those of us who admire his ability to capture the American West, not only on paper, but in film as well. THE ASSASSINATION OF JESSE JAMES BY THE COWARD ROBERT FORD will be screened at the Toronto International Film Festival, which runs from September 6-15, 2007. The film will also be featured at the 64th Venice Film Festival, running frrom August 29 to September 8 in Italy. The September issue of Cowboys & Indians magazine is previewing the movie on its front cover with a photo of Brad Pitt, who stars as Jesse James in this long-awaited Western. Writer Jordan Rane offers a detailed overview of Pitt's career, examines the mythos of the real Jesse James, and reports on previous movies - ranging from the classic "Jesse James" (1939) to the campy "Jesse James Meets Frankenstein's Daughter" (1966) - that have focused on the 19th-century bandit from rural Missouri. The film is expected to have a limited US release on September 21, 2007. 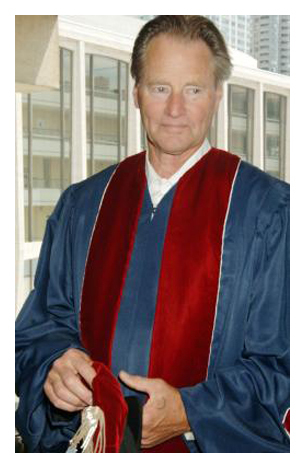 New York's Juilliard School conferred honorary doctorates to seven distinguished artists and cultural leaders during their 102nd commencement ceremony on May 25, 2007. Among the recipients was Sam, who was honored with a Doctorate of Fine Arts degree. Other recipients included Stephen H. Clapp, Frederic Franklin, Stephen Sondheim, Dan W. Lufkin, Benny Golson and Audra McDonald. The Juilliard School has set this country's standard for education in the performing arts since its 1905 founding. The Public Theater in NYC has announced its selections for its 2007-2008 season. The season will conclude with the U.S. premiere of KICKING A DEAD HORSE, a co-production with Dublin's Abbey Theatre. Once again Stephen Rea will star with Sam directing. The play premiered at the Abbey Theatre in March with a four-week run, and will also be staged for 12 more performances at the Abbey from September 12-22. The play will premiere on June 17, 2008.